I can hardly wait!! 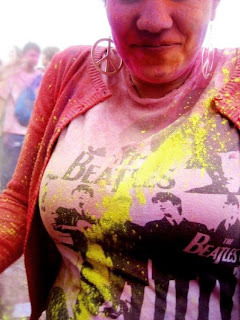 THIS Saturday, Festival of Colors. 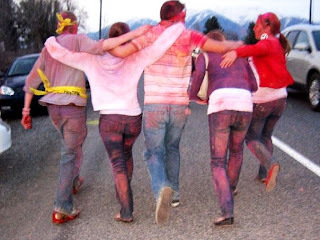 Last year was a total blast, partly because we weren't expecting such wonderful brouhaha-the cardigans, the foreverly pink-tinged WHITE shirts, the llamas, the chalked temple, the delicious pizza afterward (slash scaring the people in the pizza joint with our chalk-diseased skin) and the friends. Although the group is discombobulated this year, I am stoked for another round of incredible pictures, chalk throwing, and memories. And this time I won't wear a white shirt. (I think that's how you spell it. brooke. 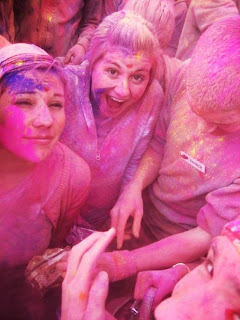 can i please oh please be part of your life at the festival of colors? meaning, lets get all our favorite people together and go. take extra pictures for me, please. Sorry (as always) for snatching Claire. I hope you guys had a great time though! I want to see some pics too.